The Abingdon New Testament Commentaries series offers compact, critical commentaries on the writings of the New Testament. These commentaries are written with special attention to the needs and interests of theology students, but they will also be useful for students in upper-level college or university settings, as well as for pastors and other church leaders. In addition to providing basic information about the New Testament texts and insights into their meanings, these commentaries exemplify the tasks and procedures of careful, critical exegesis.In this volume of the Abingdon New Testament Commentaries series, Steven J. Kraftchick both studies these two epistles in their late first century context and discusses their relevance to the contemporary Christian church. The author discusses the importance of the insider/outsider language, the harsh polemical tone of both letters, and their reliance upon the Old Testament and both early Jewish and Greco-Roman thought. "Because of the numerous similarities between Jude and Second Peter (the latter probably made use of the former), Kraftchick emulates many commentators by treating the two epistles together. In antiquity few writers commented upon Second Peter; the letter is little used in the liturgy. But this does not diminish its importance as providing an insight into aspects of life in the early church. Kraftchick sees Second Peter as possibly originating in the period 90-100 CE (earlier than many commentators). Its pseudonymous authorship and nature as a 'farewell testament' were common enough at the time, enabling the writer to cloak his own arguments in the garments of a revered, authoritative personage of the past. The letter's teaching on the delay of the parousia is among its most striking features; it is the only NT writing to teach that the present world will be destroyed by fire, though such a notion is found in intertestamental Jewish writings and among the Stoics. Kraftchick brings nothing startlingly new to an already well-furrowed exegetical field, but his skill at synthesis and clarity of expression will be appreciated by the students for whom this entire series is intended." --Casimir Bernas, Holy Trinity Abbey, in Religious Studies Review, Volume 29 Number 3, July 2003. - Publisher The Abingdon New Testament Commentaries series offers compact, critical commentaries on the writings of the New Testament. These commentaries are written with special attention to the needs and interests of theology students, but they will also be useful for students in upper-level college or university settings, as well as for pastors and other church leaders. In addition to providing basic information about the New Testament texts and insights into their meanings, these commentaries exemplify the tasks and procedures of careful, critical exegesis. In this volume of the Abingdon New Testament Commentaries series, Steven J. Kraftchick both studies these two epistles in their late first century context and discusses their relevance to the contemporary Christian church. The author discusses the importance of the insider/outsider language, the harsh polemical tone of both letters, and their reliance upon the Old Testament and both early Jewish and Greco-Roman thought. "Because of the numerous similarities between Jude and Second Peter (the latter probably made use of the former), Kraftchick emulates many commentators by treating the two epistles together. In antiquity few writers commented upon Second Peter; the letter is little used in the liturgy. But this does not diminish its importance as providing an insight into aspects of life in the early church. Kraftchick sees Second Peter as possibly originating in the period 90-100 CE (earlier than many commentators). Its pseudonymous authorship and nature as a 'farewell testament' were common enough at the time, enabling the writer to cloak his own arguments in the garments of a revered, authoritative personage of the past. The letter's teaching on the delay of the parousia is among its most striking features; it is the only NT writing to teach that the present world will be destroyed by fire, though such a notion is found in intertestamental Jewish writings and among the Stoics. Kraftchick brings nothing startlingly new to an already well-furrowed exegetical field, but his skill at synthesis and clarity of expression will be appreciated by the students for whom this entire series is intended." --Casimir Bernas, Holy Trinity Abbey, in Religious Studies Review, Volume 29 Number 3, July 2003. 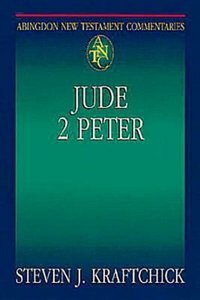 About "Jude, 2 Peter (Abingdon New Testament Commentaries Series)"
The Abingdon New Testament Commentaries series offers compact, critical commentaries on the writings of the New Testament. These commentaries are written with special attention to the needs and interests of theology students, but they will also be useful for students in upper-level college or university settings, as well as for pastors and other church leaders. In addition to providing basic information about the New Testament texts and insights into their meanings, these commentaries exemplify the tasks and procedures of careful, critical exegesis. Kraftchick is the Associate Dean of Academic Affairs at the Candler School of Theology, Emory Univeristy in Atlanta.